When we think of heroism during the Civil War, we most often think of brave feats on the battlefield. Or perhaps even the work of doctors and nurses in field hospitals dealing with the immediate trauma of war. But what happens to the wounded man when he is sent homeward? Or the soldier suffering illness who is left behind when his regiment marches off? Or what of a thousand men in camp, desperately in need of food and supplies because of some deficiency with the Quartermaster’s Department? Soldiers temporarily separated or honorably discharged from their units choked Union supply bases and Washington City during the Civil War. They were often destitute, neglected, starving and wholly without the means, physical or financial, to get back to their units or get home. And those officers leading new regiments to the front often found themselves woefully unprepared to handle the task of caring for those under their command. This side of Civil War history, those tribulations unrelated to the battlefield or even to camp life but unique to the wandering soldier, can all too easily fade off to the periphery of our attention. Knapp was born in Jamaica Plain, Massachusetts in 1821 to Jacob and Louisa Bellows Knapp. His father was a minister in Boston, but the family soon removed to Walpole, New Hampshire where Knapp spent much of his youth. The stunning house that belonged to the family still stands there. Knapp graduated Harvard College in 1843 and then Harvard Divinity School in 1847. Around 1853, Knapp introduced himself to a new school teacher in Brookline, Lucia Alden Bradford. About 20 years old at the time, 13 years younger than Knapp, she was intelligent and capable. Her father, Rev. Claudius Bradford, was a fiery antislavery activist who, in 1851, had delivered a sermon in Bridgewater, Massachusetts against the Fugitive Slave Law that was so scathing, it cost him his pulpit there. Lucia’s mother was Maria Bradford, daughter of a Duxbury, Massachusetts sea captain who had brought his four daughters up to be well-read, progressive and hardy. (Two of the captain’s daughters, Lucia’s aunts, would become nurses for the Sanitary Commission). Frederick and Lucia were a well-suited pair. They were married in Montague, Massachusetts (where Lucia’s father had found a pulpit) on May 9, 1855. Sadly, an accident cut short Knapp’s pastorate in Brookline. In July 1854, he severely struck his knee on the door of an omnibus which caused tremendous inflammation and he was restricted to bed. His condition grew worse when he contracted a pulmonary ailment and he was forced to resign. Knapp and his wife moved to his father’s house in Walpole, New Hampshire where Knapp slowly recovered. Shortly after the Civil War erupted in 1861, Knapp (now fully recovered) was drawn into the service of a new and revolutionary organization: the United States Sanitary Commission. The USSC would take on an unprecedented relief agenda including the distribution of supplies, food and medicine to soldiers, the outfitting of hospital ships, soldiers’ homes and relief lodges, the mounting of tremendous fairs back at the home front to raise funds, among many other undertakings. Rev. 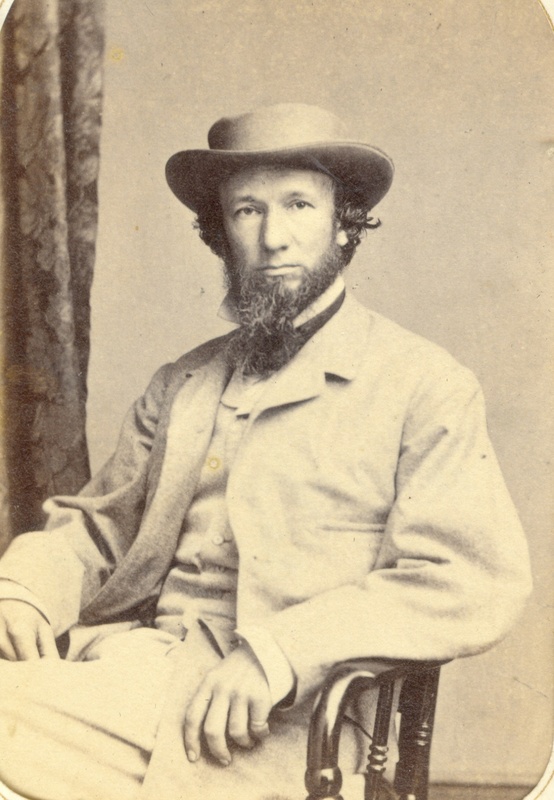 Henry Whitney Bellows (a Boston native, pastor of the First Congregational Church in New York…and Frederick Newman Knapp’s first cousin) traveled with others to Washington shortly after the start of the war to argue for the creation of the USSC. They were successful and the organization was established on June 18, 1861. Bellows became the Sanitary Commission’s president. He recruited Frederick Law Olmsted, the well-known landscape architect who was in the process of building New York’s Central Park, to become Executive Secretary. Olmsted’s impressive administrative skills would be needed to handle the operations of such a far-reaching organization. Bellows also reached out to his cousin, Frederick Newman Knapp, and recruited him to become an agent for the USSC. On the whole, the USSC dealt in the business of prevention, to see that suffering was avoided. It was, sadly, inevitable that soldiers would find themselves in deplorable conditions, sick and wounded left to their own devices, and terrible misery resulted. Therefore, the USSC soon realized that relief would necessarily become as important as their preventative measures. This fact was brought home to Knapp early in his career with the USSC. 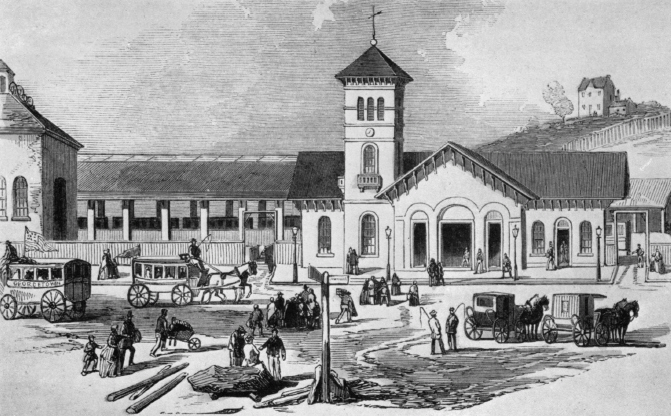 On August 9, 1861, while in Washington City, he was working to help soldiers at a key point of arrival, the Baltimore & Ohio Railroad Depot just north of the Capitol. In a set of idle cars, he found 36 men from an Indiana regiment who were too ill to move. Their regiment had arrived in Washington, disembarked and marched off, leaving behind those who were too weak to walk. The men had been in the cars for 24 hours with nothing but a few crackers to eat. The army at that time really had no way to deal with this sort of situation. The regimental surgeon was all but helpless as he tried in vain to convince various officials at army hospitals to come to their aid. But the army surgeons had more urgent problems. Knapp immediately went into action. He begged from a nearby boarding house two pails of tea and plenty of soft bread and butter. The next day, he found 30 more men from another regiment abandoned at the station. He somehow found a way to get a meal to them. So began Knapp’s service as head of the Special Relief Service of the USSC. He would also (albeit briefly) serve as Associate Secretary of the USSC, essentially third-in-charge of the organization. Knapp would exhibit a staggering knack for begging, borrowing and probably even stealing food and supplies to help thousands upon thousands of men.